Hexagonal moulded boxes fitted with three Neutrix ‘Speakon’ NL4 connectors, fully wired in parallel to carry 30 Amps. Moulded from virtually unbreakable black ABS plastic. Suitable for use with all single and bi-amped low impedance systems, and also 100 volt line. 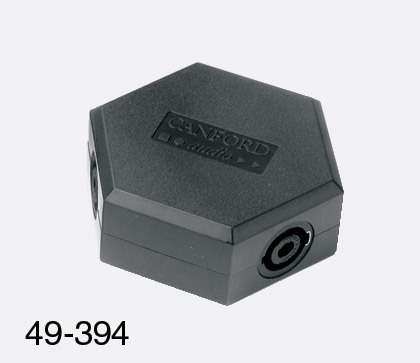 Enables bi-amped systems where there is only one amplifier output connector per channel, to be wired mainly with 2 core cable, with only a short length of 4 core required (to go from amp to splitter). For 100 volt line systems, it is ideal for temporary rigs, as individual speakers can be tee’d off the main line. The box is water resistant to IP55, so is suitable for outdoor use. 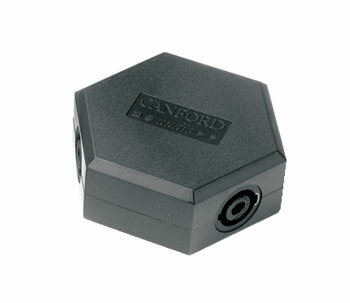 Manufactured by Canford. UK patent 2253537.